'Pro Embed' tour upgrade allows you to control embed branding and appearance of the tour. 4) Set the size (resolution) of the embed you make. in the embed code you get. 5) Review the settings in 'Launch Screen' and 'Viewer' sections. On the right you can see the preview of your embedded tour. All the changes you make are applied to the preview immediately. 'Layout' is a settings template. Once created, Layouts are available for all of your 'Pro Embeds' and you can easily reuse them. Here you can learn more about Layouts feature. Copy the embed code and paste it to the iFrame container on your site. 7) Set the Starting Panorama (in the 'Viewer' section) and Embed cover (in the 'Launch Screen' section). These settings are not saved with the Layout, but affect the embed code you obtain. 8) Click 'GET EMBED CODE' button. As this feature is only available for the tours with the purchased 'Pro Embed' tour upgrade, on this stage system checks if your tour has this tour upgrade applied. 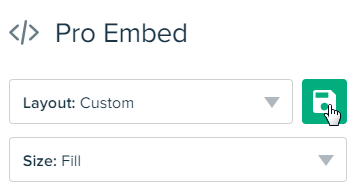 If you haven't unlocked 'Pro Embed' features for the tour, you can do it right away. Just click the button to purchase the tour upgrade or use one you have on your account. You can check the number of tour upgrades available and purchase tour upgrades in advance in the 'Upgrades' section of your Roundme account settings by this link. 9) Once the Tour upgrade is successfully applied, click 'COPY TO CLIPBOARD' button and paste the code to the iFrame container on your site.